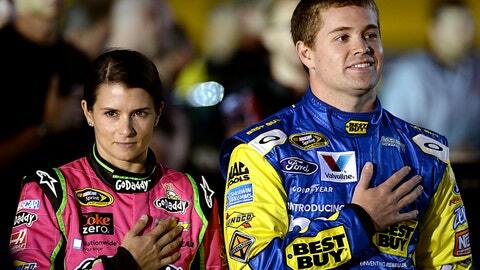 Ricky vs. Danica: Who has the brightest future in Sprint Cup? 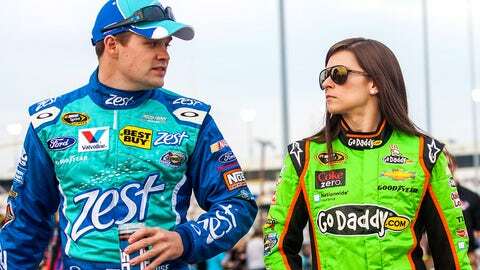 Ricky Stenhouse Jr. (left) and Danica Patrick (right) both failed to win a race as Sprint Cup Series rookies. Ricky Stenhouse Jr. won the 2013 NASCAR Rookie of the Year title. He will receive his award Friday night in Las Vegas at the NASCAR banquet. He also beat his girlfriend, Danica Patrick, out for the award. So now the yellow rookie stickers come off both the bumpers of their cars. I think we will see in this second year what and where their individual talent levels will take them. To be honest, with the experience and success that Ricky enjoyed in the Nationwide Series, I would have thought his production in the NASCAR Sprint Cup Series would have been a little stronger this year than it was. We’ve always also said that it simply takes a while for anyone, no matter who they are, coming from open-wheel cars to get acclimated to our Cup cars. The long and short of it is, this sophomore season for both these drivers is going to give us a much clearer picture of what the future holds for them. If you’ve watched him come along, then you have to give the nod to Ricky. His first year in the Nationwide Series saw him almost get fired. The second year there he came back and won the championship. He then backs that up with another championship. Does that mean I think Ricky Stenhouse Jr. will win the NASCAR Sprint Cup championship? That’s not what I am saying, because winning on the Cup side is day and night harder than winning on the Nationwide side. If Ricky holds true to form, though, I expect to see him being more competitive and running up front more frequently in 2014. Ricky finished 19th in the points this year. He had one top-five and five top-10 finishes. So there is a lot of room there for improvement. What also has to be encouraging for Ricky is that car owner Jack Roush has made a crew chief change now pairing Ricky with his former Nationwide crew chief, Mike Kelley. How quickly they can get back up to speed together will be the key to their success. Actually, I think the real question is, "What are the expectations of Jack Roush for Ricky this coming year?" I’ve seen him in the past willing to be patient for a while, but let’s face it: Jack hires race car drivers to win races for him. That may be a lot of pressure that comes back to haunt Ricky next year. On the flip side of this coin is Danica. Stewart-Haas Racing was pleasantly pleased with what they got from Danica this year. If you talk to crew chief Tony Gibson, he’ll be the first one to tell you that they came pretty darn close to meeting all expectations for Danica in 2013. There were places where she excelled that they weren’t expecting, like at both Martinsville races. Danica Patrick (left) and Ricky Stenhouse Jr. (right) competed as NASCAR Sprint Cup Series rookies in 2013. Did she stumble at some places they expected to do better at? She sure did, but you know what, rookies are expected to stumble. They are expected to make mistakes. It’s all part of the learning curve. The reality is her learning curve is a lot steeper than some of the haters want to admit. Not only was she a rookie in the NASCAR Sprint Cup series, but she was also doing it coming from open-wheel cars. Again, we’ve seen it time and time before; it simply takes longer to get a grasp of these much heavier cars with fenders if you didn’t come up through the ranks racing them. I also think it’s interesting to note that Danica’s team is the only one that is staying intact, including the return of crew chief Tony Gibson, going into 2014 at Stewart-Haas Racing. I think that says a lot of how the management at SHR viewed Danica and the No. 10 team’s performance in the 2013 season.